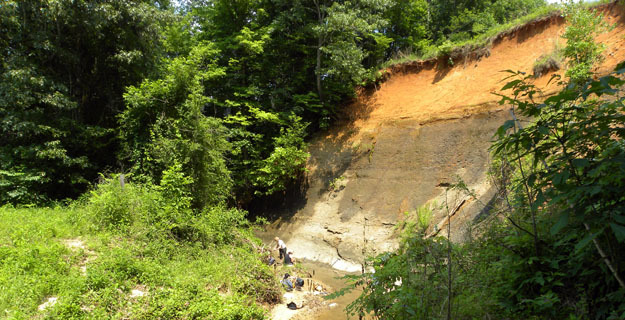 RIPLEY, MISSISSIPPI — On our last full field day we met a team from the American Museum of Natural History (led by paleontologist Neil Landman) and converged on the famous Late Cretaceous Owl Creek Formation exposures near Ripley in northern Mississippi. This site has been studied since 1810 and has produced extraordinary fossils, especially ammonites with pearly layers of aragonite still preserved in their shells. As fun as the geology was, it was even more entertaining to see the mix of southern and New York accents and mannerisms on the outcrop! The gray unit in the bottom half of the cliff is the Owl Creek Formation (Late Cretaceous); the brown and orange sands above are the Clayton Formation (Lower Tertiary). Yet another example of the K/T boundary on this trip. A mix of geologists from England, Ohio, Michigan, Mississippi, Kansas and New York at the Owl Creek Formation section near Ripley, Mississippi. Not that we choose our careers on the basis of how much fun they are. Not at all. You can quote me on this one, Susan! At this particular site I had much fun people-watching … and I was probably a tad tired of digging oysters out of the mud. I grew up playing and digging in this particular stretch of Owl Creek. Do you ever find the big Exogyra Costatas? I used to pick up buckets full of them. Besides the ammonites, there were also thin flat/layered/mother of pearl fossils. Quite a cool place to grow up.